Air Marshal Pradeep Padmakar Bapat VSM became Air Officer-in-Charge Administration of Indian Air Force (IAF). 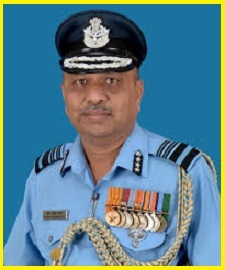 Air Marshal PP Bapat succeeded Air Marshal HN Bhagwat AVSM VM who was superannuated on 31 October 2018. Air Marshal PP Bapat was commissioned in the Indian Air Force in the Administrative Branch on 28 May 1983. He was commissioned as a Fighter Controller. Air Marshal PP Bapat, earlier carried out the responsibilities of Director General (Works & Ceremonials). Air Marshal PP Bapat was awarded ‘Vishisht Seva Medal’ by President of India in 2014. He represented Madhya Pradesh twice in National Cycle Polo tournament. Air Marshal PP Bapat was Manager of Air Force Cycle Polo team for 3 years. He was made Manager to Indian Cycle Polo team by Cycle Polo Federation of India during last Tri-series tournament between India, Pakistan and Nepal held at Jodhpur.